The Fault Tolerant (FT) servers provide an innovative solution to address planned and unplanned downtime for your most important applications. Based on the Express5800/R320e-E4 (Linux, VMWare, Windows) you have continuous availability through hardware redundancy in all components: Processors, memory, motherboards, I/O, hard disk drives, and cooling fans. Extreme high availability with operational simplicity powered by Intel® Xeon® Processor E5-2600 v3 product family. A combination of redundant hardware and redundancy control software enables 99.999% uptime for immediate failover and server virtualization protection. Read our whitepapers on Fault Tolerant Servers. Combine NEC EXPRESSCLUSTER X LAN/ WAN License with your Fault Tolerant server. NEC Expresscluster a low cost software solution for high availability and remote disaster recovery preventing data loss and protecting your IT system which finally leads to saving time and money. Enables Quick recovery from all types of failures (hardware, network, application) with zero data loss. NEC Fault Tolerant (FT) servers provide an innovative solution to address planned and unplanned downtime for your most important applications. The Express5800/R320f servers deliver continuous availability for 99.999% system uptime (5 minutes of downtime per year) through its fully redundant modular hardware featuring 14-Core Intel® Xeon® processors that support lockstep operation. The NEC FT servers can deliver continuous availability for Hyper-V by using internal storage and standard management software. Advantages of virtualization with the NEC FT server include proven scalable vCPU performance, integrated high availability storage for CapEX savings, and simplified virtualization deployment for CapEX and OpEx savings. The heart of the dual-modular redundancy architecture for the FT server is its GeminiEngine™ chipset, a feature specially engineered to synchronize redundant components and prevent CPU performance degradation due to hardware redundancy control. 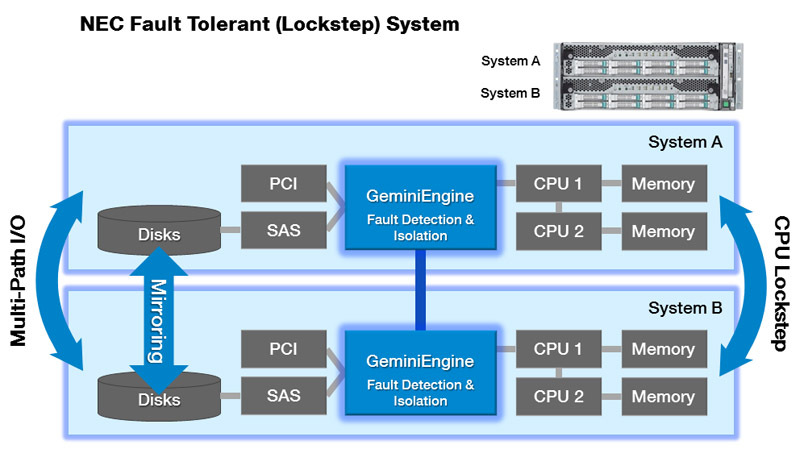 The GeminiEngine feature enables “lockstep” processing, allowing the redundant components to process the same instructions simultaneously, and thereby eliminating potential failure points for continuous processing. The award winning software safeguards industry-standard applications, operating systems, and virtualization platforms. Designed to protect business critical systems and data, ExpressCluster software is a fully automated redundancy and recovery HA/DR solution that is versatile, cost-effective and easy-to-deploy in physical, virtual and cloud environments. Verification experience with 200+ application including DataBase (Microsoft SQL Server, Oracle DB, IBM DB2, My SQL, Postgre SQL), Email Servers (Microsoft Exchange, Sendmail), ERP (SAP, Microsoft NAV), Virtualization Platforms (VMware Server/ESX, Microsoft Hyper-V, KVM) and Operating Systems (Windows, Linux), Cloud Platforms (Amazon Web Service (AWS), Microsoft Windows Azure).